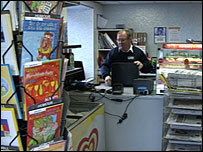 A pilot scheme in south west Scotland could be a blueprint for the future of post office services in rural areas. The "flat pack post office" fits in a small bag and can be set up in minutes in any premises with a phone line. It is currently in use in the villages of Crocketford, Haugh of Urr and Twynholm, which lost services in 2005. A clerk based at the larger Castle Douglas post office sets up in each of the villages for about 90 minutes at different times throughout the week. He then has to dismantle everything, drive to the next location and build the counter again, often within 45 minutes. Operator Gordon McCutcheon said it meant he could offer the area a fuller service than previously available. "They had a post office service with all the normal transactions," he said. "Because we are a satellite office of a main office we brought motor vehicles licences which they weren't able to get and currency and travellers cheques." The flat pack kit contains a computer, chip and pin pad and a selection of forms. But it has not been without problems, with reports of unreliability because of the mobile equipment breaking down. Customers have said they are happy to have some sort of service but expressed disappointment at the reduced opening hours. The initiative was initially met with some opposition in Haugh of Urr where villagers mounted a strong campaign against the downsizing of services. However, Castle Douglas Postmistress Lorraine Wilson said it offered an important contribution to rural life. With the threat of branch closures to come she said the "flat pack post offices" could be the way to maintain a basic service in rural areas. "The Post Office are very keen to try and maintain some sort of service in the villages because they're aware it's often the only outlet left in the village," she said.